In a small sauce pan, bring sugar and water to a simmer. Add grapefruit juice and simmer for another 2 minutes. Once cooled, add ice and your desired amount of vodka to each glass. Add 4 mint leaves to each glass. Pour Grapefruit sugar juice into each glass and stir to combine. 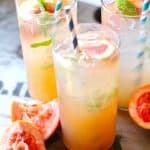 Garnish with more mint and a slice of fresh grapefruit.